The much-awaited news is finally here. HMD Global has officially announced that the Nokia 3310 will be up for purchase in India from May 18 for Rs. 3310, same as the model number. The device will only be sold in offline stores for now. The device was originally launched at the MWC 2017 event in Barcelona and it took all the limelight with its design. 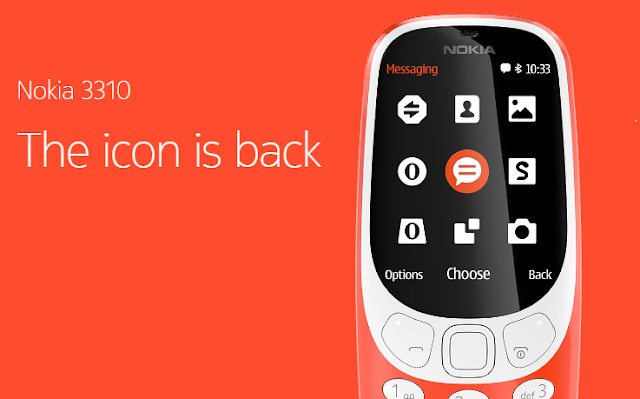 The Nokia 3310 will be made available in four colours- warm red, yellow, dark blue and grey. This feature phone has support for 2G connectivity and a 2.4-inch QVGA display can be seen up front. A micro UBB port, 3.5mm headphone jack, and Bluetooth 3.0 are the connnectivity options it has. At the back of the phone is a 2MP camera with LED flash and the package is backed by a 1200mAh battery and it weights 79.6 grams. And yeah, there's a Snake game as well, in case you forgot.